Metro Silver Crystals films are designed to give a brilliant holographic pattern with a outdoor rating of up to 5 years. Metro Silver Stardust films are designed to give a brilliant holographic pattern with a outdoor rating of up to 5 years. 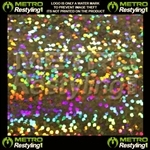 Metro Silver Bubbles films are designed to give a brilliant holographic pattern with a outdoor rating of up to 5 years. Metro Silver Pinstripe films are designed to give a brilliant holographic pattern with a outdoor rating of up to 5 years. Metro Silver Ripple films are designed to give a brilliant holographic pattern with a outdoor rating of up to 5 years.